One of the questions I get asked a lot is, “How often should I be updating my budget?” The simple answer, often. One of the issues with creating a budget is that it’s not a set it and forget it type system. A zero-based budget is something that needs to be looked at and refined often. When you are planning your spending out to the very last dollar, it’s critical that you are spending your money on things that are relevant to your life RIGHT NOW, and for most people, life RIGHT NOW is different than your life a month ago. 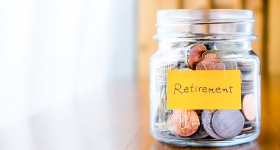 The one thing that I discovered as an Accredited Financial Counselor is that many of my clients fail to prepare another budget since the time they left our last meeting. They’re merely using the same one over and over again. This will work for a little while, but eventually, the ability to maximize your money will fade. So what does the term “often” mean? I always recommend that you should be creating a new budget every month. At the very least, you should be updating your budget every 3-4 paychecks. When you create a new budget every month, you can financially plan for things like upcoming holidays, special occasions, increased or decreased payments, and regular changes that happen day to day. If you are like me and budget your money according to your paychecks, then creating a new budget every month is critical. Regular or recurring expenses will stay the same, but they might be paid with different paychecks depending on when you get paid. Today, I want to walk you through the exact steps that I take to create and update my budget every month. This will be a very detailed guide, so grab a cup of coffee, a soft blanket, and let’s jump in! I will be showing you how I create a new budget every month using my Budget-by-Paycheck Softcover Workbook or the Budget-by-Paycheck Digital Downloads. I use a blank calendar to write out my expenses at the end of every month for the following month. For example, for January, I will start updating my budget at the end of December. For me, I like to plan so things are ready for me to use on the first day of the month. It’s a stress reliever for me to see that I have a plan and things are already done. What exactly do I write down on my blank calendar? ANYTHING that will affect my budget. Recurring bills, an upcoming birthday that I will need to budget for, an event I will need to buy tickets for, anything that I need to spend money on. Notice that I did not say variable expenses. Variable expenses are expenses that change from month-to-month. Gas, groceries, eating out, household items, health and beauty products, and pet expenses are all variable expenses. Every month, you don’t spend the exact same amount on these categories. We will get to where I add variable costs in my budget a little later. When I add the expenses to my Bill Tracker (in step #2), I put a checkmark next to it on my calendar. This lets me see quickly that all expenses have been added to my budget and are planned for. 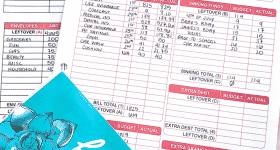 The Budget-by-Paycheck Workbook is designed to make things easier. That’s why the Bill Tracker is right next to the blank Monthly Calendar. It makes it easier to reference your expenses and when they are due so you can decide which paycheck to use to pay for them. Once you have filled out and have written down all of your expenses on your blank Monthly Calendar, it’s time to decide when you are going to pay them. I use a Bill Tracker to accomplish this. Essentially, you write down when you get paid and how much your paycheck will be. When you are budgeting your income, it will never be exact. You might be off by a couple of cents, or a couple of dollars, or maybe even more. That’s OK. Don’t get caught up in making the numbers perfect. For me, I get paid twice every month – on the 5th and the 20th. Some months have more days, so my paycheck may be different. So I take what I will get paid for a regular 80-hour paycheck (two weeks), and leave it at that even though I might get paid more or less. I use my calendar to see which bills have to be paid with each paycheck according to when they are due. Keep in mind that you want to pay your expenses before the due date. For example, my rent is due on the 1st. This means that to pay my rent on time, I have to pay it with my paycheck that I get on the 20th the month before. As you can see from the picture above, I list my February rent payment on the paycheck that I get on the 20th of January. This will ensure that I have the money set aside. I have a process for using my Bill Tracker that lets me quickly keep track of what expenses I have included in my budget, when I pay them, and when they have cleared my checking account. When I pay the expense, I highlight it in pink. This shows me quickly which expenses I have paid. When the payment has cleared my checking account, I put a line through it. This tells me that the amount has been updated and is reflecting in my “current balance” in my checking account. Here is where things start to come together. We all know that a budget is not just made up of fixed expenses. Life is also filled with day-to-day costs. So how do we budget for them? I use the cash envelope method to budget my variable expenses. As you can see from the picture above, the bottom half of my Bill Tracker is dedicated to how much I will pull out in cash for each category. For each paycheck, I subtract my fixed expenses from my income. The difference I have left over is what I use to determine how much I can spend on things like gas, food, and other variable expenses. From the picture above, you can see that the paycheck that I get on the 5th leaves me with $495 left over. I take that $495 and divide into my cash envelopes. $75 for gas, $200 for groceries, $50 for entertainment, and $100 for miscellaneous purchases. Please don’t assume that you have to have the same cash envelopes as me. I use my miscellaneous cash envelope for things like shampoo and conditioner, but you can easily change this to a “healthcare” cash envelope if that makes more sense for you. Once I know how much I need for my cash envelopes, I go to the bank and pull out the cash and organize it in my envelopes. I make my own cash envelopes that you can access in this article. If I have any money left over, I use it for expenses on my next paycheck. This is what makes this system so great. You can move money around to make it work paycheck-to-paycheck. I can see right away that I needed to use leftover money from my paycheck on the 5th to give me enough money for expenses for my paycheck on the 20th. After finishing steps 1-3, the hard part is over. 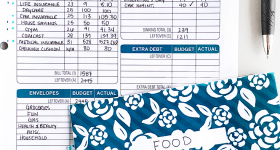 The next spread in the Budget-by-Paycheck Workbook is used to track debt payoff and expenses every month. When paying off debt, it’s always best to pay more than the minimum payment. As you can see from the example above (left page), I have listed my minimum payments from my Bill Tracker on the Debt Payment Plan Worksheet. But what happens if you come across some extra money one month or you have some money left over from your paycheck that you want to use to pay down debt? Use the Debt Payment Tracker to keep track of your payments. For me, this has more to do with seeing progress than it does tracking. Sometimes when you are paying off a lot of debt, there seems to be no end in sight, and seeing actual progress is hard. With the Debt Payment Tracker, I know I am making progress by logging my payments. It reminds me that every little bit helps, and I have a plan. It’s also great for seeing all of your debt in one place. I used the Debt Payment Plan worksheet to help me create a Debt Payoff Plan. After completing the TBM Spending Challenge, I realized just how vital tracking your money really is. It’s like a huge slap in the face and a real eye-opener. By tracking your spending, it gives you the opportunity to make your budget successful. Sure, you can say, “I’m only going to spend $200 this month on groceries,” but if you were tracking your spending and saw month after month that you were spending $400-500 on groceries, $200 is not a realistic amount. Your budget will always let you down if it’s not realistic. Tracking where your money is going is the first step to understanding how you are managing your money. It creates financial awareness. I can’t tell you enough how important this is. Without knowing where your money is going and how you spend it, you will never know what habits you need to change to make your budget work. I use the Spending Tracker to reflect on my spending for the previous months. This gives me the chance to adjust my spending habits for the new budget I create for the following month. As you can see from the picture above, there is also an area to keep track of deposits. This will allow you to keep track of how much you have in your checking account at any given time. It’s a great way to double check your work. I use the Monthly Budget worksheets to see my totals (bottom of each page). Not only does this make sure I’m not going into the red, but it lets me see how much I have left over every month to either grow the cushion in my checking account or to help pay down debt. As you can see from the picture below (left page), my Monthly Budget tells me I have $113 left over to allocate toward a goal that matters to me. I also use it decide which cash envelopes I want to create every month. For example, I have a food category in my monthly budget. I can then create cash envelopes that break down that category even more. I might create an eating out and grocery cash envelope. Something that is not pictured in the example above, and something that might make things a little easier, is writing how much you have allocated to each category. For the food example, you might want to write $400 next to the category name and then break down that $400 into smaller subcategories like eating out, etc. The Savings Tracker is much like the Debt Tracker. It allows you to see progress when you feel like you are not making any. It’s also a fantastic tool for creating a savings goal. I like to create one savings goal at a time. Once I complete one goal, I move on to the next. For me, I get sidetracked if I am saving for too many things. It’s easier if you only have one thing you are working towards. For me, it’s saving for an all-cash vacation. I can see an updated total of how much more I need to save to reach my goal every month. Once again, it’s more about seeing progress than tracking. It keeps you motivated to keep going. No matter what resources or tools that you decide to use, every step in this detailed guide should be included in your monthly budget. It doesn’t matter if you are an experienced budgeter or a beginner, following these steps will ensure you create a successful budget that works for you and your family. If you want to know more about my Budget-by-Paycheck digital downloads that you can print out at home, you can see it HERE. If you want to know more about my Budget-by-Paycheck Softcover Edition that can be delivered straight to your door, you can see it HERE. Did you find this guide helpful? Let me know your thoughts in the comments below.